Dorianne and I arrived in Madrid on Friday the 13th. We are staying near the Palacio Real and the Cathedral, adjacent to the old city. 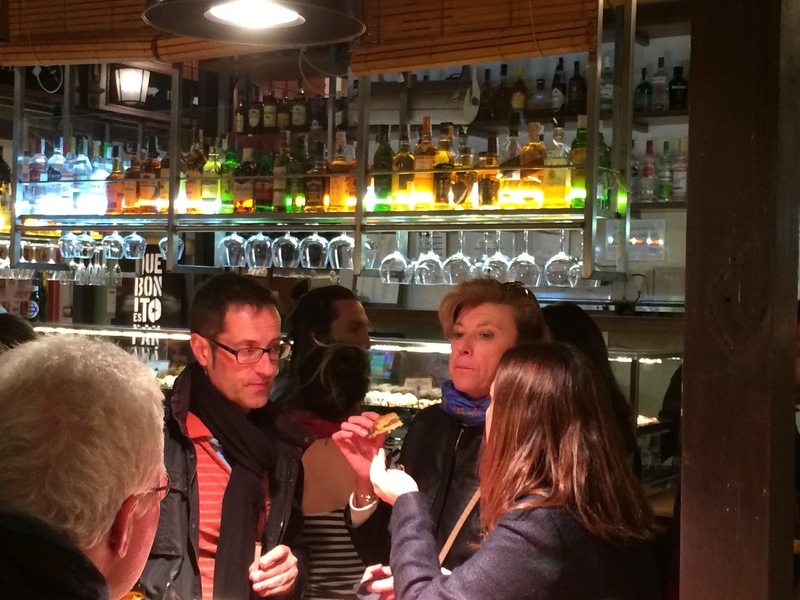 So far, we have explored a few Tapas places, including the wonderful Mercado de San Miguel (LINK) which is a moving conveyor of wine-drinking, tapas-eating revelers from vendor to vendor devouring a variety of tapas and wines or beers. The two photos below are of the Mercado. Last night (Saturday) we visited TripAdvisor.com to see what was the highest rated restaurant near us. We were pointed to La Mi Venta (LINK), a nondescript little place near the Palacio. It was rated #32 out of over 7,000 Madrid restaurants. Here is my TripAdvisor.com review: Thank you TripAdvisor.com! 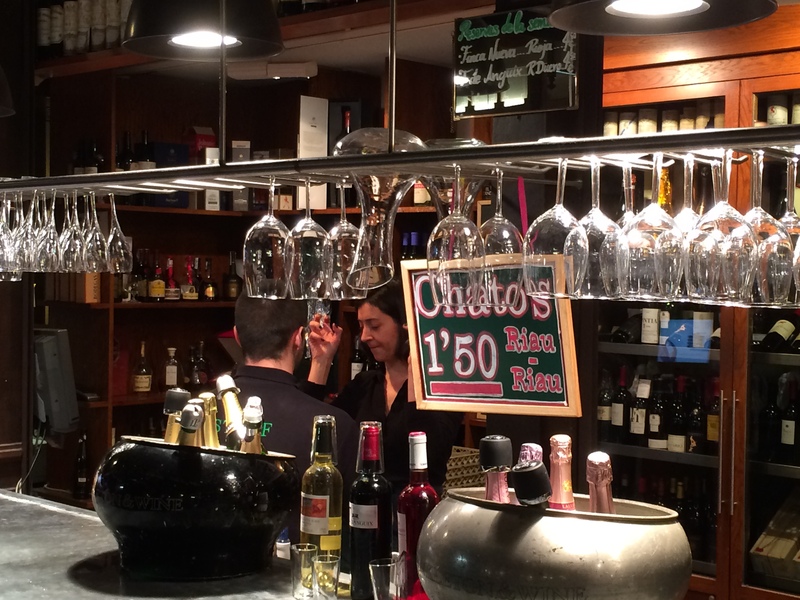 While in Madrid, we looked for the highest rated restaurant near our hotel – and found this gem just a few blocks away. La Mi Venta is very unassuming from the outside – it looks like a thousand other touristy street cafes in this area near the Palacio Real (LINK). But inside is another matter. The ground floor is a very nondescript tapas bar – but downstairs are two very intimate and lovely dining rooms. David, who presides over this area like a king, is assisted by a young man who’s name we did not get, but the two compliment each other beautifully. 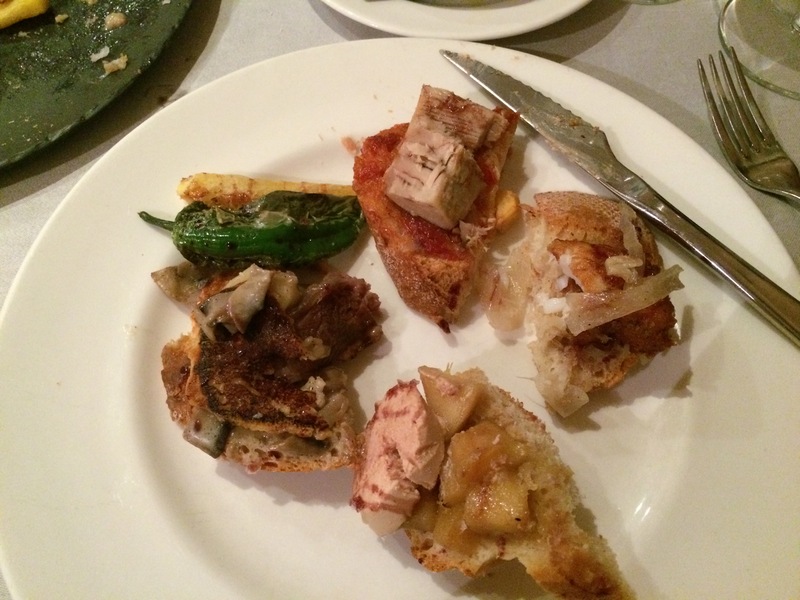 After being served a delicious bread and an amazing olive oil for dipping, we opted for tapas – two of the combination plates that evening. The menu includes a number of Tapas selections, plus other small plates, salads, and larger meals at the back. 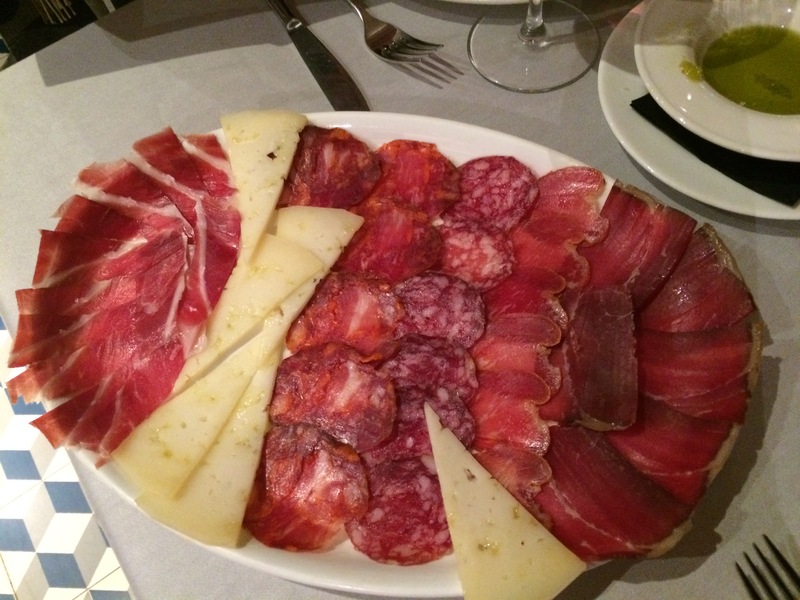 Our first Tapas Platter was a combination of Iberico Jamon (LINK) (reputed to be the best in Madrid – and I have no argument there), and other charcuterie with Manchengo cheese. 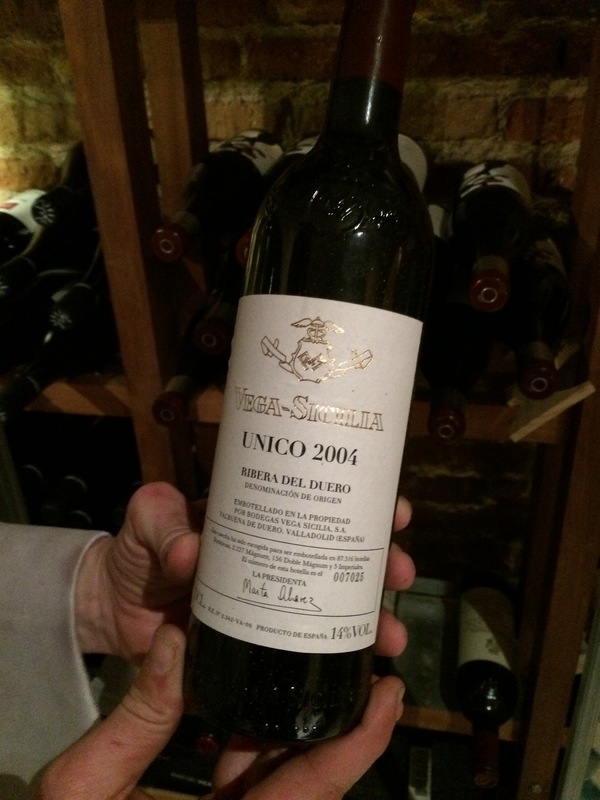 At David’s recommendation, we ordered a bottle of 2010 Pago de Carraovejas Riserva Tinto (LINK). A blend of 97% Temperanillo, 2% Cabernet Sauvignon, and 1% Merlot – a truly superlative wine (Parker – 94 Points) for only 44 Euros (I saw the same bottle in a retail store the next day for 41 Euros). The wine was a perfect accompaniment to the Tapas. For our second platter, we chose a seafood base – Pike, tuna, foie gras, and Pork back with fried potatoes and mild chilies. All amazing. The Spanish foie gras (which won the French competition last year) is very light and delicious and the geese are not force-fed to produce this amazing product. 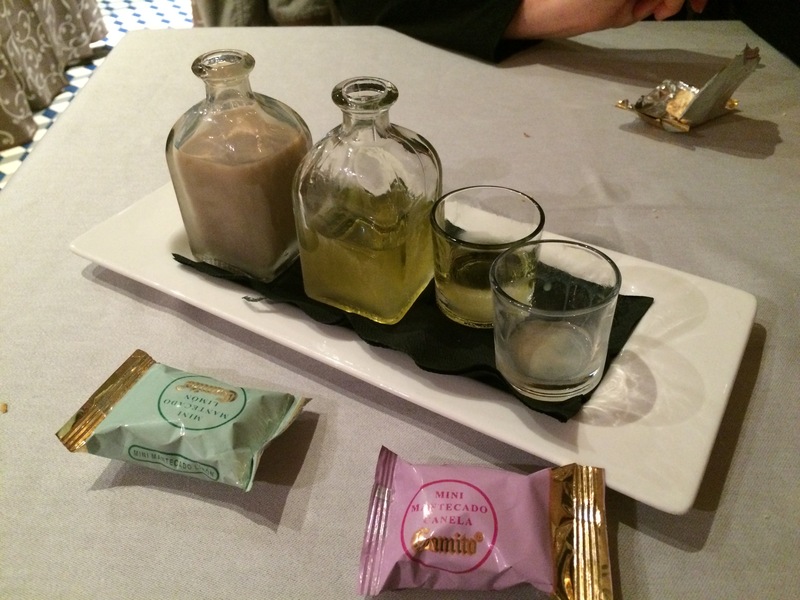 We had digestives at the end of the meal, a version of limoncello and a chocolate cream liquor with wonderful confections. The entire bill with tax was 84 Euros. This restaurant is a don’t miss if you are visiting Madrid. 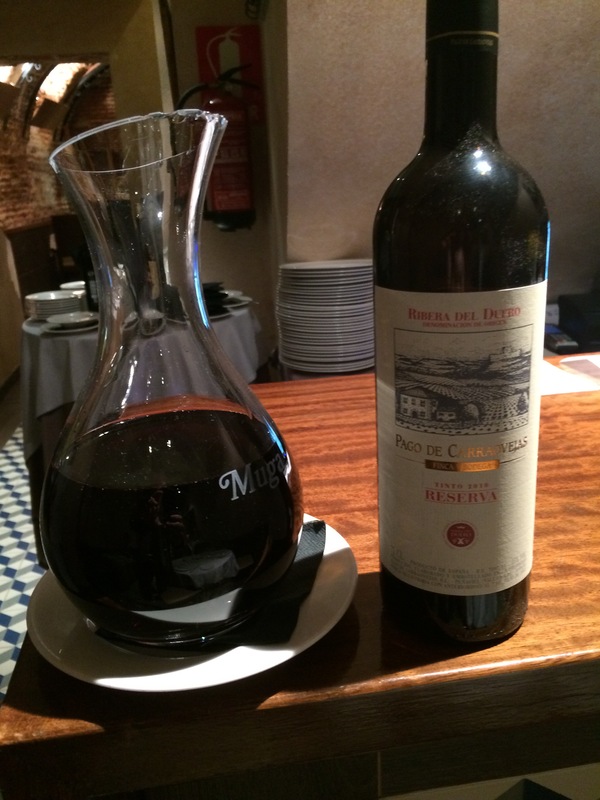 This will serve as our introduction to fine Spanish Wine. The wine had a very appealing nose of dark fruit with a hint of savory minerality. David decanted the wine for about 20 minutes before serving. He noted that it is one of the hottest wines in Spain currently. The 2010 Pago de Carraovejas Riserva Tinto drank much like a California Cabernet – big and bold at 15% alcohol, a trait of many Ribera Wines. For a Digestive, we were served two liquors made on the premises, a Limoncello-like liquor and a Chocolate Cream Liquor, topping off a grand meal. 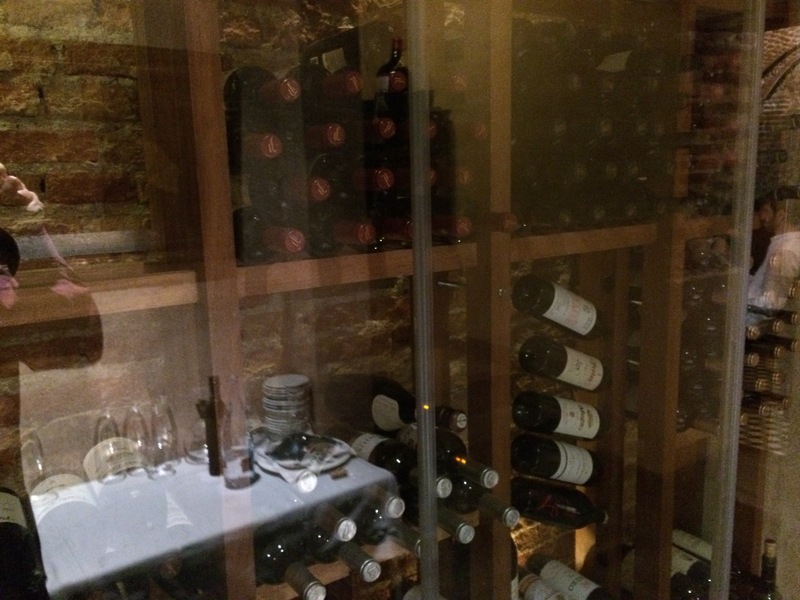 Then, a quick tour of the wine cabinet with David.